Paste, Pomade, and Clay...What's the Difference? LET'S FIND WHAT WORKS FOR YOU! The world of hair styling products can be a confusing one and sometimes very frustrating - especially when the products don't make our hair look they way we want it. Trust me - I've been in your shoes before! Whether you are brand new to styling your hair (and have never touched a hair product before), or whether you are a seasoned veteran who has tried a lot, there is always more to learn when it comes to hair products. Often times its overwhelming trying to understand what each one does and trying to keep up with new products that hit the market. All of these different product names and types can make it quite difficult finding the right one (or two) styling products for your specific hair styling needs. What's the difference between a hair paste, pomade, or a clay? How about gels, crèmes, or waxes? And should I be using any mousse, heat protectant, oils, or hair spray? Which one is right for my hair style and hair type? Well I hope we can answer some of these questions for you here and to give you confidence that you are making the right decision about which hair product the first time. Pomade is one of the most commonly used words to describe men’s hair styling products today. Now whether or not the the word 'pomade' is used correctly is a completely different story, in general, it seems to be the catch-all term to describe anything that’s not a gel or fiber. Pomades are primarily designed to showcase your hair in a slick, neat manner while providing a high shine finish (ie pompadours, ducktails, slickbacks, or classic side parts). 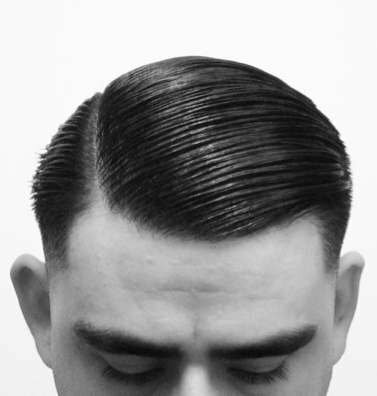 Basically, pomades work extremely well for hairstyles that are formed using a comb. Unlike gels, pomades do not dry out or leave your hair hard and crunchy allowing you to style your hair again and again throughout the day. Options for medium to high shine pomades are widely available. Oil-based pomades are basically grease or petroleum, which makes it a very cheap option compared to water-based pomades. In the 1950s, the term “greaser” appeared to describe the greased-back hairstyles that use this type of product. Their ingredients are water insoluble which makes them practically impossible to wash out in the shower (buyer beware!). While the petroleum and grease might give your hair long lasting shine and infinite mold ability, it does come at a cost. Practically anything you use to wash out oil-based pomades will also strip all of the natural oils out of your hair, potentially leaving it looking quite unhealthy. One final thing worth mentioning is that oil-based pomades also leave you more prone to acne, particularly along your forehead and on your scalp. If the shampoo and conditioner you use doesn't effectively wash your hair and properly remove all the oil and grease from the pomade, then your pores and hair follicles can be clogged resulting in unwanted buildup and undesirable acne. Water-based pomades on the other hand are a little more user-friendly. They are designed to allow you to achieve similar looks and holds to oil-based pomades, but they wash out easily with water. Most water-based pomades don't hold as firmly as the oil based type, but they maintain flexibility and can be restyled throughout the day. Check out our Fireball Pomade or Peppermint Pomade which fall within the water-based pomade category. There is no consensus on the definition of “hair paste”, but there are obvious similarities between them all when you see and touch them. In general hair pastes are a bit thicker in consistency than pomades, and their consistency and texture can range from something like a thick toothpaste to tacky glue. A hair paste usually gives your hair a medium to very firm hold, and can leave your hair with a natural matte finish or add a touch of shine. This makes hair pastes the most versatile men’s hair products out there and can be recommended for practically any hairstyle. Hair pastes are ideal for all hair lengths, types and styles…from short to long, fine to thick, messy to combed. And they are water-based, so washing them out is super easy. You really can’t go wrong with choosing a product in the hair paste family! It's why our Natural Beeswax Paste is so popular. Now typically, thicker hair pastes require them to be warmed up before application. Rubbing thicker hair paste between your fingers or palms will soften the product allowing you evenly distribute it throughout your hair. Once the product is applied and your hair is styled, the product will begin to cool again and re-thicken, which helps give your hairstyle the hold it needs. We have two products in the hair paste category and they're quite different, but quite versatile. The Natural Beeswax Paste is a firm hold, matte finish paste. It’s very thick and it definitely requires warming up in your hands before applying it. It is by far our best seller because it has amazing hold and leaves your hair looking natural with a matte finish. The Moroccan Texture Paste is a medium hold and provides semi-shine finish. It gives your hair great separation and flexibility, but it also works as a volumizer and texturizer prior to blow drying. The Moroccan Texture Paste also smells amazing! Clay hair products are a relatively new classification for men’s styling products and these products can range from very thick to very creamy consistency. The one thing in common with all clay hair products is the fact that they actually contain a clay ingredient in their formulations. The most commonly used clay is bentonite, which is completely natural and usually forms from weathering of volcanic ash. It’s incredibly fine and powdery making it almost “velvety” to the touch, and can swell as much as 6x when contacting water. Clay (bentonite) makes your hair feel “fatter” by adding body, thickness and structure to the individual hair strands, and ultimately gives your hair structure and stability throughout the day. Hair clays are ideal for hairstyles that require tons of volume without having to worry about the styling product weighing down your hair. Our Sculpting Clay is has an incredibly smooth and creamy texture which allows it to be spread easily and evenly through the thickest of hair types. Its lightweight formula also absorbs quickly into the hair without leaving any unwanted residue. Applying the Sculpting Clay can be applied before (as a pre-styler) or after (as a finish product) using a blow dryer to give you extra volume and stability without weighing your hair down. Either way you choose to use it, your hair will be left with matte to semi-matte finish and give your hair medium to high hold. So what hair products are waxes similar to? Waxes are most comparable to pomades, but typically have a lighter hold. They typically have the medium to high shine, but they lack in the overall hold. Like pomades, waxes are ideal for hairstyles that require a comb such as the pompadour, slickback uncuts, classic side parts , or ducktails. What is TEXTURE POWDER & VOLUMIZING POWDER? The power of powder! The vast majority of men don’t even know texture (or volumizing) powders exist, let alone know how to use them. Let me tell you what - if you want to create instant crazy volume and natural lightweight hold then this is the recommended product for you. Our Texture Powder is primarily a pre-styler and are applied either before or after you blow dry your hair, but most definitely before you finish it off with a pomade or paste. All powders typically contain the same basic ingredients. They all have a base of silica silylate. This is a rough particulate (unlike silicones which are smooth and shiny). The roughness sticks to your hair fibers and create the volume that you need by increasing friction between the hair fibers. In addition there are certain chemicals in the texture powder that absorbs moisture, which in turn rids your hair of excess oil. This also contributes to the extra boost in volume. They’re generally recommended to apply to the roots of your hair. Using your fingers to mix the powder within your hair will give that much needed boost. If applied to just the ends of your hair, you can create a different effect; this typically creates great separation among the strands and piecey effect. The negative that we’ve seen in using texture powders is that it doesn’t leave your hair soft like other products might. Your hair isn’t crunchy like a hair spray, but feels a bit stiff. In addition, application is a bit different that a typical hair product in a jar. Using too much and you may notice it at the roots of your hair. Apply it sparingly to ensure it blends well is the best way to use it. What is HAIR CREAM & LOTION? Hairstyling cream can essentially be called “hair lotion” because that’s exactly what it’s used for. They have a lotion-type consistency (versus the solid, pasty-type consistency of pomades and pastes) and they work great for moisturizing your hair in an effort to control and maintain frizzy hair. Hair creams offer a light, softer hold compared to any other hair styling products, and they are recommended primarily as a pre-styling product as they add substance, shine and separation to the hair. So if you’re looking to tame unruly hair and control the frizz on curly haired guys, then adding a crème to your styling regime would be recommended. Our Sculpting Clay has features and benefits that fit within this category, but it is slightly thicker and has actual clay in it. Hair gel is the most known and most commonly used (and probably most hated) hair styling product for men. 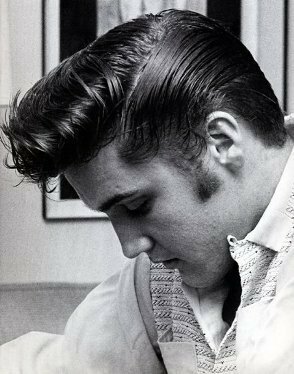 It would be a fairly safe bet to say that every guy has tried using hair gel at least once in their life. It’s typically the “starter” hair product for most guys who begin styling their hair in middle school or high school because it’s cheap and readily available at any local store….and unfortunately for a lot of us, we simply didn’t know any better! Gel is great product if your intention is to have stiff, non-movable hair and if you don’t care if products damage your hair. It does work well with all hair lengths, thicknesses, and textures to mold, sculpt, and hold your hair in place. Gel tends to coat the hair strands and binds them together to lock them in place. Gels are water based styling products that have a concoction of harsh alcohols and holding chemicals. They typically leave your hair shiny and rock hard and don't have the flexibility to style your hair throughout the day. Sounds great right (insert sarcasm here)? Hair loss, dry hair and scalp, flaking….we don’t think so either! That’s why Mister Pompadour has not and will not introduce a hair gel to our product line. We only want styling products that contain natural oils and proteins to promote healthy hair and scalp while naturally hold hairstyles in place. So basically, if you’re using gel to style your hair you might as well shout to the world “Hey! I’m new at styling my hair”. Mousse is probably the most recognizable hair product type there is based solely on its unique foamy texture. And for most guys, hair mousse is also one of those products they tend to shy away from. Possibly because mousse received a bad rap in the ‘80s for making hair feel crunchy and sticky. Or maybe it is the simple thought of product squirting out of a metal aerosol can that turns guys away. Either way, mousse is a hairstyling product that is designed to add body, light hold and shine to your mane. One could argue that mousse is probably one of the most underutilized styling products for men, especially for men looking to achieve hairstyles that require volume. Applying mousse at the hair roots and blow drying from the roots outward is key to achieving massive volume. Using mousse with this method works well for all hair types – thick, fine, short, medium, long, curly, wavy and everything in between. Unlike hair gel, if you disturb the crunchy hair you won’t be left with flakes and residue. So what makes mousse different? Mousse works by surrounding the hair strand with synthetic resins called polymers and assists the hair in holding its shape when it dries. Mousse will give hair a certain amount of lift at the root level, which makes it a perfect candidate at a pre-styler. Use mousse to get the initial volume – then use another product, like the Natural Beeswax Paste, to better define and shape the hairstyle. Some mousses are specifically formulated to thicken fine hair - making it a perfect choice for hair that is beginning to thin out or fine hair types in general. The hair product marketplace is filled with all types of hair spray products that can set your hairstyle, enhance shine, reduce frizz, and even promote volume. Hair spray can be used by itself, or used in conjunction with any hair paste or pomade. They can also be sprayed on the outer layer of hair to lock in the hairstyle in place, or sprayed deep into the roots to coat the hair and lift them up. Typically, hair spray is packaged in an aerosol can or bottle with a pump sprayer, and is primarily geared towards women – this does not mean that men can’t and shouldn’t use them as well. To make life simple, stay focused on the holding power because that’s the main difference between all hair spray products. They can generally be categorized as flexible-, medium-, or maximum-hold. Flexible-hold hair sprays offer the least amount of staying power and work well for longer hairstyles. They provide just enough control to reduce frizzing, but still allow some natural movement. The medium-hold hair sprays have a slightly stronger hold than the flexible types and should be used sparingly if movement is still desired. Medium-sprays are ideal for hairstyles that require volume, but don’t necessarily need to be stiff. Maximum-hold sprays are obviously the strongest of the bunch and they work to keep every strand in the same place throughout the day. If you’re styling product isn’t giving you enough hold throughout the day, then blast it with a few shots of maximum-hold sprays and that’ll do the trick. You’ll still maintain the definition and texture of the hairstyle, but it’ll now be locked in place. Just be mindful that some types of hair spray product may require washing with a clarifying shampoo to remove all residues. While Mister Pompadour does not offer a stand-alone hair oil product, we do include oils within our products to help condition, strengthen, and improve overall hair health. Take the Moroccan Texture Paste for example – its ingredients include argan oil and coconut to condition and soften the hair throughout the day. Thank you for taking the time to read about the various hair product categories on the market today – hopefully you learned a thing or two along the way! There is a lot to consider when choosing the right product for your perfect hairstyle and we want to make sure you are equipped with this valuable information when making that decision. As always, we strive to offer you the best products and the best information you can find. Please feel free to reach out to us at anytime if you have any further questions or comments, or if you’re simply looking for a product recommendation. We are always here to help! This was the most imfortmative post I’ve ever read, I can practically call myself a veteran for hair products at this point. Perfect for begginers like me! Loved your dedication to this. Thank you! This was the most informative, unconfusing and complete description of men’s hair care products I’ve ever found. It confirmed my choice of “clay” as my styling tool of choice. A good clay is hard to find. I used Aveda for about a year and was shocked after about a year to realize that my very thick hair was thinning. I through that stuff away! I have just excitedly placed a reoccurring order for your clay product. I’m looking forward to trying it for the first time, and feel comfortable that it will continue to be my styling product of choice. Once again, thank you for posting this article. This is a well-constructed and a very informative article. I have been using pomades for a while and this is my first time to know about water-based pomades. Can you recommend where I can buy such products? Thank you. Very clear and straight to the point info, well done, will be trying your products for sure. Keep up the great work! Thankyou for such an elaborate information. Very educative, We would like to try the products with full confidence. I have a question. I am searching for a hair product for my son and my husband. My husband has always had super short hair. (A 1 on top) and I’m trying to get him to grow his hair out. The only problem is he’s stuck in the 90’s thinking that gel or some greasy product are his only options. I’ve looked into clays, waxes, pomades and puttys but they are all too expensive for me to try out and not like them. I want something that holds well (preferably no shine but whatever) but that also does not flake or leave an oily or greasy residue on my couch or on the seat of my car. He is also wants to train his hair back. Your article is very informative but I want a product that doesn’t leave an oily or greasy residue. Basically I want it to dry up without also flaking. Thanks. I immediately threw all my hair gels after reading this article and replaced them by your Natural Beeswax paste! its a great article compared to another just read before. but i have a question can we use two product or not once like pomade and wax mixing them at once. is there any conciconses or not. Brilliant article! What is a prestyler? This helped a ton !! Very informative and precise. I am a Barber and Cosmetogy educator i will share this great information with all my colleagues and students. Thank you. This is a fantastic article, thank you! What Does Your Hair Say About Your First Impression? What’s the Difference Between Texture Powder & Dry Shampoo?